Jericho Beach offers a tranquil getaway. Here you can head out on the waters of English Bay or explore lush parkland. Cool off with a swim or explore the bay in a sailboat. Visit the beach park to enjoy outdoor concerts, spot local wildlife and discover a historic museum. The beach is named after Jeremiah Rogers, a 19th-century logger and businessman who set up camp here. Explore more than 1 mile (2 kilometers) of sandy coastline. During the summer, swim in the brisk waters of English Bay. Look east to see a panoramic view of downtown Vancouver’s skyline. Try windsurfing off the west end of the beach. Rent a boat from the Jericho Sailing Centre and venture out on the water. Stop by the association’s popular waterfront restaurant, where you can grab a burger before heading out to explore the bay. Jericho Beach Park is located right next to the beach. Wander along the paths past wooded lawns and a large duck pond. Look for otters and wild rabbits, which are known to live here. Bring a takeaway lunch and settle down at one of the picnic tables. Tennis courts and playing fields are also available. Head to the east end of the park to see one of the oldest buildings in Vancouver, which is home to the Old Hastings Mill Store Museum. Here, learn about the fire that destroyed much of Vancouver in the late 19th century and look at photographs and artifacts from the city’s past. Every July, Jericho Beach hosts the Vancouver Folk Music Festival. Buy your tickets in advance and enjoy lively music in this laid-back setting. Visit during the winter for beautiful views of the snow-capped mountains on the North Shore across the bay. The beach is open to the public and located about 3 miles (5 kilometers) west of Vancouver’s city center. Access the area by bus or park nearby for an hourly fee. Located in West Point Grey, this vacation home is within a 10-minute walk of Burrard Inlet and Jericho Beach. University of British Columbia and Kitsilano Beach are also within 3 mi (5 km). This beachfront vacation home is located in Vancouver (Kitsilano), close to Jericho Beach, Kitsilano Beach, and English Bay. Also nearby are Spanish Banks and Vancouver Maritime Museum. 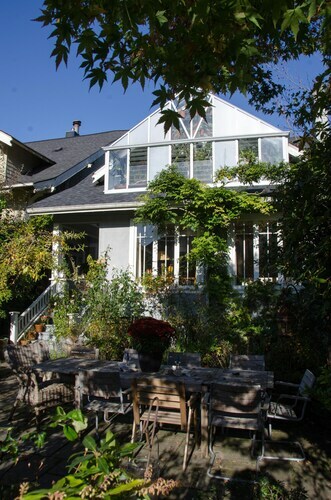 Located in Kitsilano, this vacation home is within a 10-minute walk of English Bay and Jericho Beach. Granville Island Public Market and Kitsilano Beach are also within 3 mi (5 km). 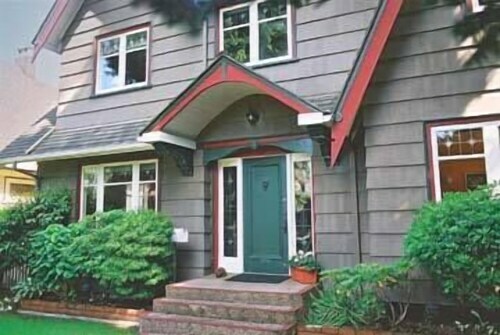 Located in West Point Grey, this guesthouse is within 1 mi (2 km) of Burrard Inlet and Jericho Beach. University of British Columbia and Kitsilano Beach are also within 3 mi (5 km). Located in West Point Grey, this property is within 1 mi (2 km) of Burrard Inlet and Jericho Beach. Kitsilano Beach is 2.2 mi (3.5 km) away. Located in West Point Grey, this property is within 1 mi (2 km) of Burrard Inlet and Jericho Beach. Granville Island Public Market and Kitsilano Beach are also within 3 mi (5 km). Located in West Point Grey, this property is within 1 mi (2 km) of Burrard Inlet and Jericho Beach. Kitsilano Beach is 2.2 mi (3.6 km) away.